British comedian Ricky Gervais has appealed to fans to help victims of last week’s earthquake in Chile following an emotional email from a young fan who survived the disaster. Gervais posted the email on his blog, and asked fans to give to the Red Cross appeal. “I’m from Chile, where we just had an enormous earthquake, tons of people died (though not as much as in Haiti) and over a million people’s homes were hit hard,” said the fan, known only as Max. "Personally I wasn’t struck as hard, but I was left without electricity and running water for three days. I had enough food and bottled water to last me at least a week, so that wasn’t a problem; and a battery-operated radio to listen to news about the earthquake. 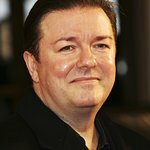 “Ricky Gervais’ audio work really helped me get through the days while keeping me in a good mood, thinking about things other than the horrible destruction of my country. The stories of the round-headed buffoon Karl asking what were the names of “those things in the movie gremlins”, or when Steve was trying to be cool driving a car in his teens only to end up crying because some cooler kids wanted to get a pig in the car, really made the difference to me in that moment of despair. To give to the Red Cross appeal, click here.